Introduction: Despite availability of excellent antibiotics, orbital complications’ following sinusitis is rather common. With the emergence of fungal sinusitis orbital involvement by the disease is getting frequent. Prevalence of life style disorders like diabetes mellitus has added to the woes. This article attempts to review the entire gamut of orbital complications following sinus infections. Aim: This study aims at analyzing orbital complications following sinusitis at Government Stanley Medical College Hospital during the period 2009 – 2013. 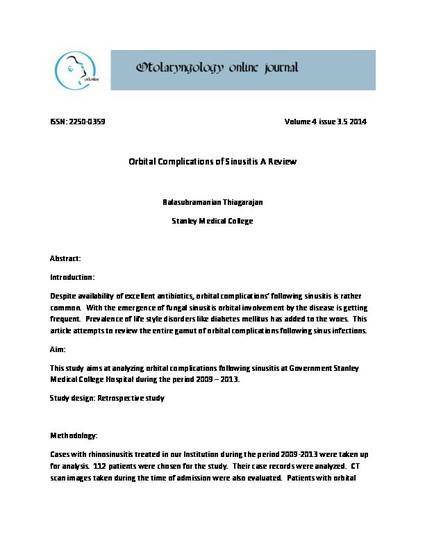 Study design: Retrospective study Methodology: Cases with rhinosinusitis treated in our Institution during the period 2009-2013 were taken up for analysis. 112 patients were chosen for the study. Their case records were analyzed. CT scan images taken during the time of admission were also evaluated. Patients with orbitalcomplications following rhinosinusitis were included. Chandler’s classification was used to categorize the stage of disease. Results: 112 patients were included in the study. 76 Male patients 36 Female patients 26 patients developed orbital complications Number of male patients with orbital complication – 22 Number of female patients with orbital complication – 4 Number of patients who died due to complications - 2 Conclusion: High degree of suspicion, early diagnosis and aggressive medical management of Chandler’s categories I and II will go a long way in preventing irreparable damage to vision. All our patients were managed initially with parenteral antibiotics. Patients who do not show improvement even after 4 days of antibiotic therapy were taken up for surgical management.